Helps prevent food particles from sticking to your teeth and gums. Deeper cleansing and polishing that traditional tooth pastes alone cannot provide. More alkaline saliva that helps improve the overall health of your oral cavity. Antioxidant-enriched approach to your dental care. 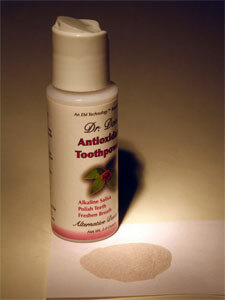 Dentists actually use powders to clean and polish your teeth! Now you can too! Conventional toothpastes contain soaps and anti-bacterial agents that are mostly alcohol, and flouride. Cassava Root Powder, Volcanic Pink Clay, Organic Quartz Mullite (EM-X® Ceramic Powder), Elderberry Extract, Concentrated Sour Cherry, Cranberry Powder, Gourmet Vanilla, Xylitol, Menthol Crystals. Purchase now and don't miss out any longer on the benefits that Dr. Don's Antioxidant Tooth Powder can provide to you everyday!